Your observations are important in helping wildlife enthusiasts understand the distribution of plants and animals in Essex and to identify changes. This form is for submitting a single record or observation. If you have many records from one place, or many records of one species, use the alternative forms instead. Complete the form and submit details of your observation to our County Recorders so that we can add your record to our County Database. Where species are difficult to identify, or you are a beginner in a group, we may need verification of the identification. This is why we ask you for contact details. The most distinctive feature of the Common Hedgehog is its coat of spines. When threatened, the hedgehog can roll up into a ball, with spines sticking out in all directions. 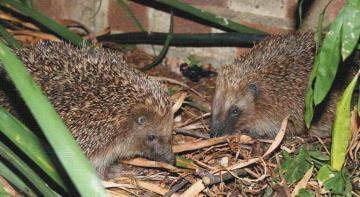 Hedgehogs are nocturnal animals, living in undergrowth, hedgerows and gardens. They eat slugs, snails, insects and even mice. When winter arrives, it will make a pile of dead leaves and go to sleep. At first they may wake up occasionally, but will then settle into hibernation until the next spring. Don't use pesticides or slug pellets in your garden or you will kill off species which are links in the food chain. Slug pellets can kill Hedgehogs. If you are overrun with slugs and your resident Hedgehog(s) do not seem to be keeping the numbers down you could try beer traps (dishes of beer placed at the bottom of plants into which the slugs fall or climb). You can also encourage hedgehogs by putting out food and water throughout the year, but not bread or milk, which upset its stomach.